Essential Skills Archives - Mentor Europe . And there are good reasons for this including optimism bias and strategic misrepresentation. But ‘resources’ are not taken as seriously as they should be when setting completion targets. Let’s face it, it’s impossible to have detailed resource plans available for the first rough-cut program schedule. It’s not possible – simply because the work is not understood anywhere close to what it should be. This is the plain unvarnished truth. When a program is kicked-off, completion dates are targets – nothing more. For this reason, resources can only be allocated on the basis of crude estimates. How much effort and skill will be required over the life of the program? No one knows for sure. It’s not an exact science. Some estimates can be ‘informed’ by looking at comparable past situations and their results. And they can be reasonably accurate. But how many business-critical program estimates are informed by historical performance? Not many - because the work is not the same. It’s rare to find any comparable past situations; the work is new and different. First-cut plans are always built on thousands of unproven assumptions – which will take months to confirm. Against this background, it’s hard to be precise about future demand for program resources. Many companies struggle to identify the unique capabilities they need to execute business-critical programs. It doesn’t help if business-critical programs are described only as a list of bold bullet-points, loosely linked to a broad company objective. What do these bullet points mean, specifically? Are they likely to create the wrong idea? Does anyone really know? Proper alignment - between resources and program strategy - is difficult for any organisation that develops function-specific plans in a bottom-up style - or in isolation from each other. But this is what happens in most organisations. Demand for program resource should be a by-product of the detailed program planning process. And provide answers to crucial questions. Like . . . is the work completely understood? What are the key work packages? What skills are needed to do it? Are ‘new’ skills needed – and in what skill domains? When are they needed – and for how long? Are they available in the company today – or will they need to be recruited? Are any of these skills completely new or scarce? What’s the lead-time to recruit? And so on. Unless there are clear answers to these questions, resource management will be an eternal open sore. Resources will tend to be estimated at the gross level only - which, for planning purposes, is about as useful as a chocolate teapot. This means the right people – with the right skills - won’t be available when they are needed. And the upshot of this is - the business effortlessly sleepwalks into “time-slicing” - a term used to describe using “parts of lots of people” from different functions to work on a program. You can have 40% of him, 25% of her, 55% of them, provided it doesn’t interfere with their day job. We have ‘lots of people around who can help’ – and on the dreary dance goes. If you’ve been around the block a few times, you’ll be familiar with the pattern. Too familiar, perhaps. Anyone spending less than 40% of their time on a program won’t make a meaningful impact on a program. What 40% do you get anyway - the time available after their normal work is finished – or the first few hours each day? What’s always overlooked is this; the particular business-critical program is not the only one the company is running. There may be three, four or more. If the company is repeating the same pattern on multiple programs, then you can see how the seeds of organisation chaos take root. It’s worth remembering that a part-timer’s work is always controlled by a line manager somewhere else; it’s bound to be harmful to the program. 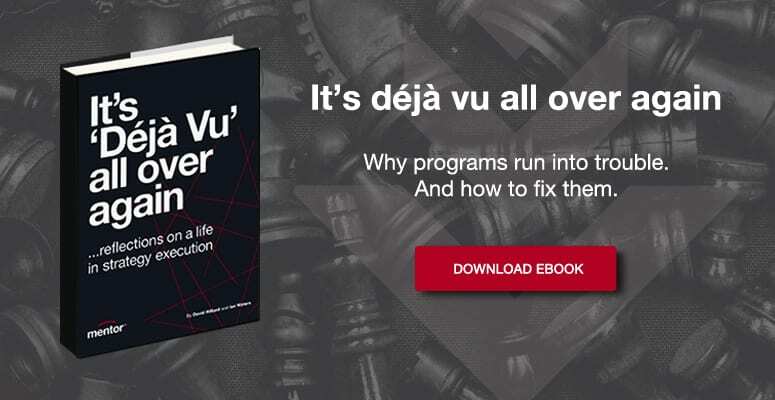 It’s unmanageable - a huge drag on a program – causing friction, time-wasting and fruitless complexity. Extensive “time-slicing” is a sure sign that the business hasn’t done enough to convert strategy-speak into action. The business hasn’t positively ‘decided’ to make the program as success – by allocating enough resources. The Head of Finance would not be expected to do their job with a rag-bag of part timers from other functions across the business. So how does it make any sense to even think about running a business-critical program with an assortment of second-choice people - who can be spared – from other functions? Check out why you can’t plan and manage any program with useless fragments of people’s time in our video. It’s nonsense – an exercise make-believe - and a strong signal that businesses prefer to shrug off disturbances to functional structures. So, to make the resource allocation task more manageable, senior executives should recognise that business-critical program completion dates are estimates. And ‘estimates’ are simply that, estimates. They can be refined over time and in time become commitments - as the team asks the crucial questions and discovers more about what it has to do. What has to be done, when, what new capabilities, what skill domains – and so on? Finally, with all the novelty, complexity and interdependencies surrounding every business-critical program, it’s doubtful that it can ever be ‘completed’ on a specific day. It’s more sensible to think in terms of a ‘date-range window’ of a few months, in which the program will end – meeting all its targets. Any program that finishes on a ‘specific day’ – as originally forecast - has almost certainly spent more than its budget, done much less then intended - and left at least one unhappy client in its wake.